Rhododendron is a name derived from the Greek words “rodon” meaning “rose” and "dendron" meaning “tree." These trees have dark green leaves and produce bell-shaped flowers in trusses or ball-like clusters. When they were first introduced to the United States only the wealthy class grew them as they could afford the estates needed for growing them, but as home gardening became popular the middle class began cultivating them as compact trees so less land was needed. Most species of rhododendrons are found growing in cool climates such as the Himalayas, northern Myanmar and southwestern China. Others are scattered in regions of northern Asia, North America and Europe. The rhododendron is the state tree of Uttarakhand, India, where the Indian Postal Department issued a postal stamp commemorating the flower. In the United States many species and hybrids grow in the Pacific Northwest. Many rhododendron trees take at least 20 or more years to reach flowering. It takes about 50 years or more for a rhododendron tree to acquire its most favorable form. How large a rhododendron tree grows in the wild depends on how much moisture is available to it. Most of the trees growing in wildernesses are affected by the monsoonal summer rains. Rhododendron trees in India grow in forests at altitudes as high as 2,500 to 3,000 meters or more, according to Wildeel.com. Rhododendron trees are valuable landscaping plants, noted for their showy flowers and stunning foliage. These evergreen trees produce gorgeous flowers at different times of the year, giving color to a winter garden. In spring, the tree’s erect young leaf shoots form a striking “candlestick” form. Rhododendrons look best when planted in groups to create particular effects. Certain factors such as color and size should be considered. Taller plants should be planted in the back with medium ones in front and the smallest ones planted around edges. Because native rhododendrons grow in an environment where there’s a continual supply of moisture, they should be protected from drying effects of wind, frost or hot sun when cultivated. The rhododendron borer infests branches and weakens them so they easily break. The pest causes leaves to wilt and turn brown. Rhododendron lace bugs can be detected from dark insect excrement on lower leaf surfaces. These pests, which are about 3 mm long, according to the North Carolina State University website, are small dark and spiny. The rhododendron tip midges are small maggots that distort new leaf growth, leaving leaf margins that are tightly curled under. Weevils leave notches on margins, causing leaves to wilt in hot weather, which results in death if a tree is heavily infected. 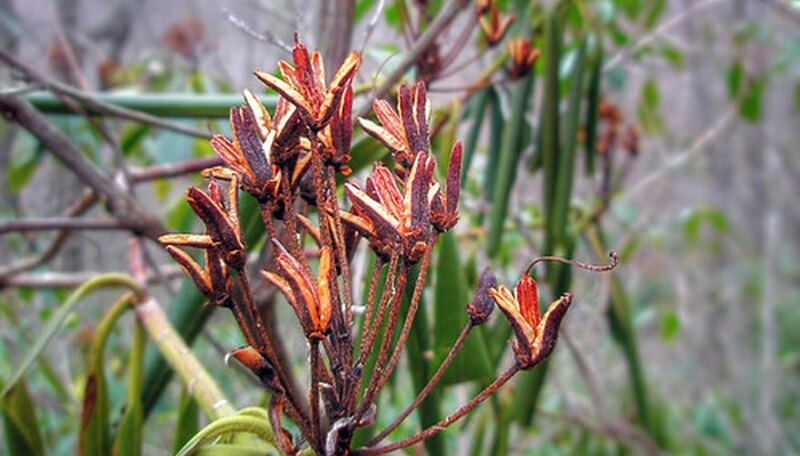 All rhododendron parts are toxic. Symptoms of someone ingesting any part of the plant may include abdominal pain, stomach irritation, convulsions, irregular heart rate and rhythm, coma and even death. The honey made from the tree’s flower nectar is also poisonous.